This entry was posted on Sunday, July 24th, 2011 at 9:21 am	and is filed under Coding, PID. You can follow any responses to this entry through the RSS 2.0 feed. You can leave a response, or trackback from your own site. Thanks for taking the time to compare! I check the math and find out that I was using an aproximation for my PID. That aproximation is not needed here (it’s more for n degree sofware filtering). As this post is more than a year old, I don’t know if this is the best way to tell this. In case you think there’s a better place to send it, please let me know. In fact, the quantification error produced by both approximations (the one implemented by @Brett and the change @jojo proposed) is nearly the same. When solving in the Laplace domain, the transfer function of the integral term is Ki/s. The Laplace domain is meant for continuous time, though, so any digital implementation (discrete) will produce not exact measurements. There is another domain, called Z, which is meant for discrete time. So, when implementing transfer functions in digital systems, we should take this as a reference. As you can see, both the Fordward and Backward approaches take the area as a rectangle. The first one, takes the previous sample and pushes it fordward, assuming the signal is constant from (k-1)Ts to kTs (Ts=sampling period). The second one makes the same, but taking the last sample as constant value, so pushing it backward. In fact, the performance of both of them should be the same. Although when changing the setpoint to a greater value the Backward method is faster (because it quantifies more than the ideal integration), when setting it to a lower one they sweep. So, depending on the application, especially in bipolar ones (i.e. controlling a motor in two directions), we’ll get no better performance with none of them. 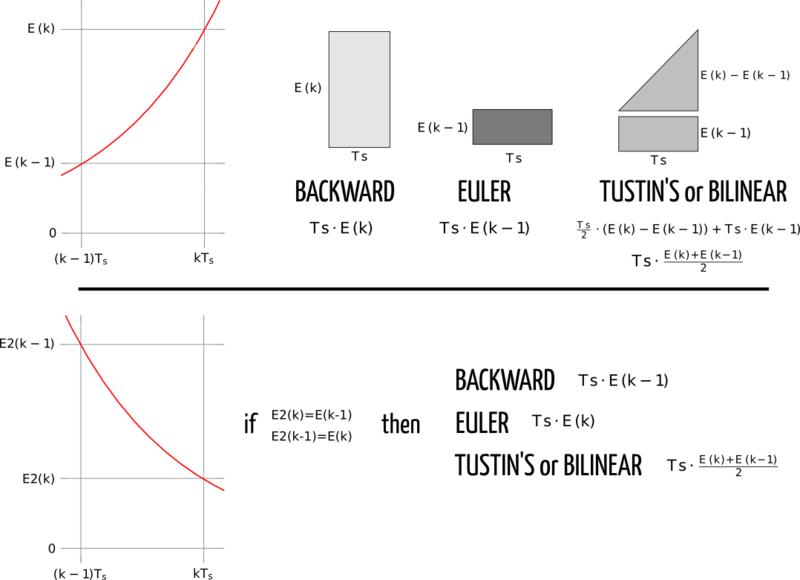 The third approach, Tustin’s, takes the area as a trapezoid, considerably reducing the quantification error and getting a value just in the middle between the previous ones. So attending to theory, this would be the best one (there are also mathematical reasons I don’t get to understand which say so). Apart from that suggestion, when you performed the comparison with Ts=5s, the systems were probably not meeting the plant timing requirements, which means the controller’s work speed was not enough for a good performance. Although it can be used, depending on the application, not having into account the plant dynamics can lead to unstable responses. 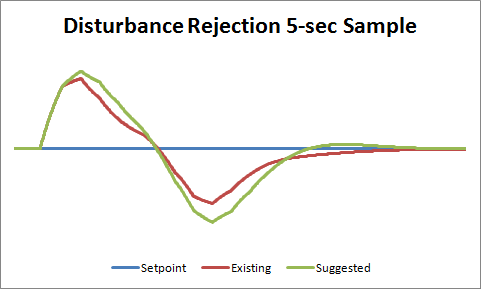 For an optimal control system we should try to meet the Real Time requirements (which typically means to set the sample time at least 10 times lower than the minimum change time in the plant). 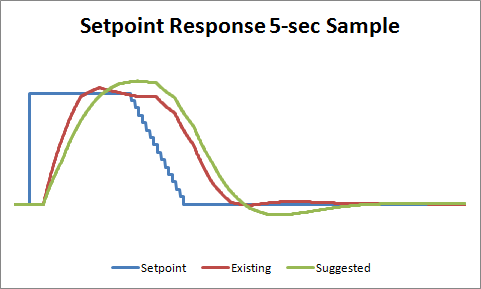 In the setpoint response comparison, when starting the ramp down, the existing system has reached its steady-state value (nearly the setpoint value), while the system suggested by @jojo is still transitory. 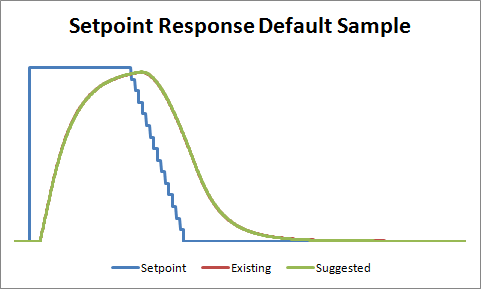 For a better analysis I think it would be good to wait until both systems have reached their steady-state value, before changing the setpoint. In the disturbance rejection comparison we can see that the existing one (@Brett, Backward) performs better with positive disturbances, but the suggested one (@jojo, Fordward) is quite faster with negatives (besides initial states not being the same), es exposed previously. Finally, I hope you can excuse me for my bad english, and I wish this information/explanation will help you improve this great library. I would also like to congratulate you not only for doing it, but for writing all these explanations to help beginners understand easily control.